Big Mountain was set ablaze by the orange of the setting sun. A juniper-tindered fire scorched my skin, casting its umber glow upon the faces of the three matriarchs that sat across from me: Linda, Edith, and Loraine; “The Grannies,” the voices of reason, women’s voices that speak for the land and the Navajo community. The light reflected upon their aged faces, accentuating their wrinkles and kind, wise eyes. Wool, artistically stained with juniper, prickly pear, and sage, slipped through their hands-- hands worn and weathered from a lifetime of weaving, herding, and tending to land, children, and their communities. 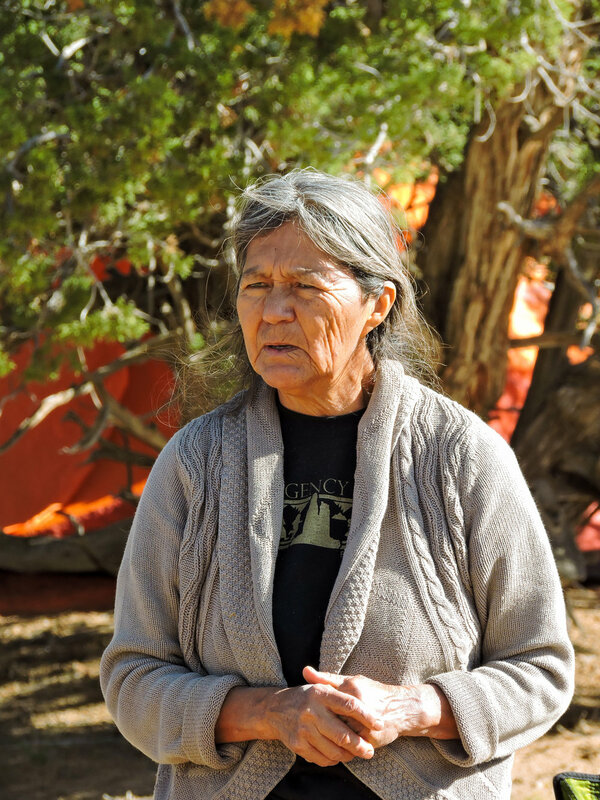 Edith delicately ran her hands over one of her intricately-patterned woven rugs as she talked about raising her children, grandchildren, and great grandchildren on these very lands, about their struggles with industry interests that seem to care little about their impact on the land, water, and air upon which the Navajo people depend. As our bodies rested on the rugs and our fingers felt the wool made from the sheep tended by these women, The Grannies recounted their most recent fight: a trip to New York City to protest the Navajo Generating Station, a nearby coal-fired power plant, from being purchased. Their resistance paid off; the prospective deal was stopped and the station will be closed in a year--a success for these women, their families, and others who spoke up for renewable energy, pure water, and clean air. Edith recalled her pride and admiration for Axheenaba, her youngest great grandchild and a budding activist, who united people together and led the chants saying, “water is life.” She remembers a time when the aquifer was pristine and full and feels called to fight for the land, the water, the animals, and of course, her children, grandchildren, and all those who will come after her. These are The Grannies--grandmothers, mothers, wives, sisters, wool makers, rug weavers, and fierce protectors of their homeland. In a place of abundant sunshine and winds, they seek clean energy and jobs that won’t make the people sick.